The DeKalb County Board of Commissioners recently honored the DeKalb County District Attorney’s Office for creating a program dedicated to giving offenders ages 17 -25 a second chance. The Anti-Recidivism Court was created by District Attorney Robert James in December 2011. Since the program’s inception, 22 participants have successfully completed the program. The Anti-Recidivism Court is a collaborative partnership among DeKalb County Public Defenders’ Office, DeKalb County Magistrate Court and DeKalb County District Attorney’s Office. Currently, 20 participants are enrolled in the year-long Anti-Recidivism Court. As conditions of the diversion program, each participant is ordered to: report to private probation, perform community service, undergo random monitoring, report to monthly compliance hearings and abide by a curfew/electronic monitoring. Additionally, participants must pay any restitution involved with their arrest, enroll in an academic program if they have not obtained a high school diploma/GED and attend behavior modification classes. “We focus on developing the person and providing them with the skills needed to be successful in life,” said James. “We not only provide them with life skills training but also a strict guideline to follow. Many do not complete the course ♦. Atlanta Anger Management offers two such Lifeskills Courses. Anger Management is a course of treatment that seeks to help people whose anger emotion is causing negative problems in their personal, business or public life. Anderson & Anderson’s Certified Anger Management Facilitators are influencing how anger management is practiced throughout the United States. Richard Taylor of Atlanta Anger Management sets the standard in Atlanta with many others following our lead. We offer what is needed and other companies soon copy us and offer it too. Two companies have even copied our name or derivatives thereof. Such flattery, thank you. These lifeskills learned are positive by design and move the participant from low motivation into high motivation to commit to the process if they only honor their Pre-Trial Diversion Program requirements by completing the number of hours required. ♦ Unfortunately many get their Letter Of Enrollment attending their first class to (get off the hook) for their first Probation Meeting and then disappear into their past patterns that only lead to more trouble and eventual arrest ~ jail time for violation of their Agreed On Terms Of Pre-Trial Diversion Program. Stricter penalties needed to be served for violation in our estimation. Participants completing the Anger Management Class (Course) leave with enhanced life skills for greater self understanding (awareness), learn to control one’s emotions, better social awareness for better interactions and more productive relationship management. In most cases reduced recidivism is also achieved. NOTE: Anger Management is not psychotherapy. Anger Management is psycho-education and a highly personalized form of treatment using educational approach to skill development. Specialized Anger Management Certification Training of 40 Hours or more by national certification companies should be the standard for practice. Anger Management does not seek to help those in need of counseling to find ways of avoiding their anger altogether. According to the American Psychiatric Association, anger is a normal human emotion. It is not a mental disorder, consequently it is not responsive to traditional counseling, psychotherapy or psychotropic medication. Additionally anger is not listed in The Diagnostic and Statistical Manual of Mental Disorders (DSM) DSM-IV-TR. Anger is exemplified by anger outbursts or tempers that flair out of proportion to the causing stimuli or situation. Anger can be aggressive as in verbal abuse or physical abuse but also passive as in emotional blackmail, negative control issues, silent treatment etc. The individual experiencing anger often lashes out against family members, friends, acquaintances coworkers, even strangers. Anger can be managed using skills/tools that can be learned through a course of proven Anger Management curriculum. On Demand One Day Accelerated Intensive Weekday Course Monday through Friday at higher cost. Private One on One. VIP Concierge Anger Management – used for those needing us come to them. Cost is not a problem. Anger Violence Assessment Evaluations – used to determine if the individual needs anger management at this time. The first step is to call Richard at 678-576-1913 and we get to know one another. It is usually fairly brief but provides you the opportunity to discuss current situation and what some of the issues are and define your requirements as dictated by your referring party. SYLLABUS – Some Counties Require 8 Hours/Weeks Others 12 Hours/Weeks. Willingness to Change and Developing Discipline; Life Review: Is It Working For You? at 5555 GLENRIDGE CONNECTOR – ATLANTA ANGER MANAGEMENT. The 5555 number sequence is a message from the Universe that your life is about to go through some major changes, with new freedoms and living your inner- truths. through experience, making important life choices and decisions, courage, motivation, telepathy, the intellect, activity, influence, the adventurer, sensuality, the promoter, natural flair, vivaciousness, health, sympathy, motivation, competitiveness, idealism, non-conventional, curiosity, magnetism, experience, pleasure-loving, vitality, the visionary, expansion, opportunity, imagination, individualism, healing, choice, mercy, kindness, invention, resourcefulness, competitiveness, self-emancipation, physicality, impulsiveness, energy, travel, excitement, auspicious opportunities. The number 5 symbolizes the principles of multiplicity, progression and passion and signifies the need for change, variety and new growth. The number 5 relates to personal freedom, making positive choices and major life changes, transformation and transmutation. When Angel Number 5 appears consistently it indicates that there are changes for the better coming into your life. The energies are now building up to force much needed changes and these changes may come around with unexpected haste, but they will usher in positive energies and opportunities and will catapult you along on your path in the right direction. ranks Florida as #1 Most Stressed State in which to live with Georgia right behind as #2. Do we Atlantan’s really need to be told this? But which states take being stressed out to the next level? 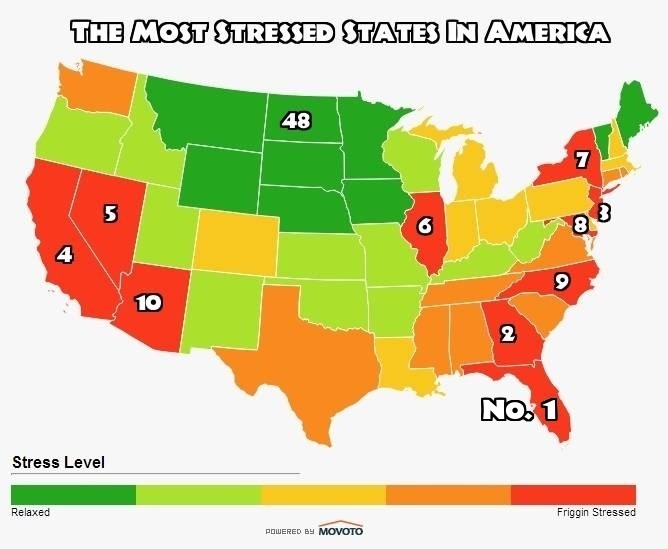 Florida have earned the dubious distinction of being the most stressed out in the country. Georgia comes in 2nd. Maybe if we have more traffic and work harder we can make it to #1 next year! The higher any of these was, the more stressful the people of the state are. They used data from the U.S. Census’ American Community Survey for 2008-2012. They ranked each state from 1 to 48 (with one being the most stressed side of the scale) in the six individual criteria. These ranks were then averaged into one Big Deal Score, the lowest of which was the most stressed out state in America. See Chart Below. Georgians work the most hours on average of any state’s residents in our top 10 according to MOVOTO. Could it be less people doing jobs that previously had more people doing them, so longer hours worked per worker? Do we stress over losing a job since the unemployment rate for Georgia is in the top 20 percent of the 48 states? Certainly with Atlanta ranked as #2 of the Most Discourteous Drivers earlier this year our driving time / Marta commuters time, adds a lot of stress for everyone in Georgia. 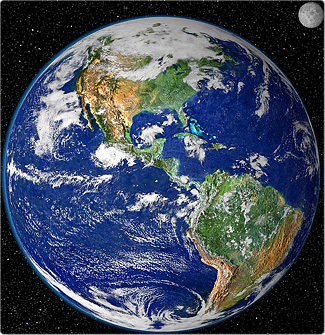 The average travel time to work in the United States is 25.4 minutes, according to the U.S. Census Bureau. Check out the interesting map that was developed to check commute time by zip code. Zoom In, move around the map or enter your town or zip code to find commute times for your area. Does it express itself with AGGRESSIVE DRIVING or ROAD RAGE? 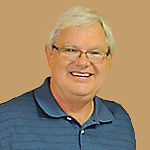 Richard Taylor or Atlanta Anger Management offers help! Our hearts go out to this family and friends. CBS Tony McNary interviews family of Road Rage Victim death from Road Rage. If you are get mad while driving ( Road Rage ) do something about it before tragedy strikes you and innocent people. You just experienced a driving episode of ” Road Rage”. You lost it and and a scary thing happened with another driver…it worked out but you admit it is time to find out how to control yourself better. You do not want to be charged with Road Rage and have to go to jail and be charged with an official Road Rage charge. OR you have been charged with Road Rage and are required to attend Anger Management classes. 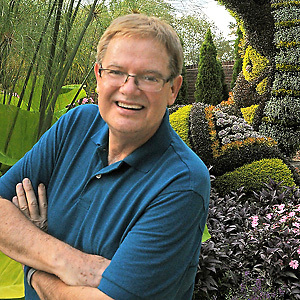 Call now and set things up with Richard at 678-576-1913. Get help immediately before it is too late and consequences get out of hand. People are killed often in Road Rage incidents. You can reduce stress and make that stress reduction last longer if you tailor your workout specifically to your personality type according to Men’s Health Magazine Article. THE AESTHETE: You thrive on the artistry of sports and exercise. THE THRILL-SEEKER: You work out for the rush. THE SOCIAL ACTIVIST: You like the camaraderie of exercising with others. THE DEATHOPHOBE: You exercise to stay healthy, but wish there were an easier way. THE FANATIC: You like feeling committed to your exercise routine. THE ENERGIZED ANIMAL: You hit the gym to release energy. Attorneys are often under high pressure to produce and win cases. In large law firms there often are many office dynamics that can lead to anger, in office outbursts and general feelings of discord. Court Proceedings, Case Outcomes, People and Situations all lead to frequent anger feelings and resulting “without thinking” behaviors. If you are an attorney and currently experiencing anger at home, in the work place or even out in public or while driving, common sense would tell you, it is best to do something about it before it brings you down a destructive path. Atlanta Anger Management can help. We are Atlanta’s #1 choice for anger, rage and conflict help. Atlanta Anger Management is a Certified Anderson and Anderson™ Provider. The trusted name in Anger Management and Emotional Intelligence Education and Training. 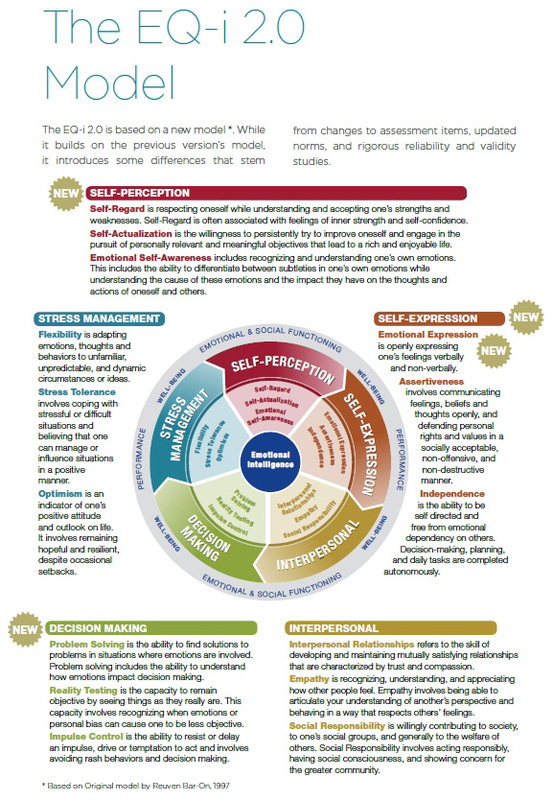 We offer the Bar On EQ-I 2.0 Assessment that can be accessed 24/7 from your own computer. If further enhancement is warranted then Individual Coaching Sessions are best for specific work addressed to your areas of weakness and also enhancing your areas of strengths. Looking at your strengths is an important part of Coaching as this is why you are so successful to date. This is a rather cheap investment in your self-development to help you attain peak performance and propel you further toward your goals. Your peers will notice a difference in you, your spouse will notice, your children, judges, friends and you will notice too. You can pay using PayPal or call with Visa/MC/AMEX information. Once you have paid, you will be e-mailed and invited to enter the Bar on EQ-i 2.0 website 24/7 and complete the 133 question assessment that will take about 13-25 minutes. Once the Assessment is scored, you will receive your assessment results via email. You will be impressed and excited learning new valuable insights and information provided by this assessment. Clients feedback has been extremely positive and are appreciative for the insights. Make a decision towards helping yourself through this period of angry feelings. E-mail today to get started.